I’ve just finished reading a book called ‘You are not so smart: Why your memory is mostly fiction, why you have too many friends on Facebook and 46 other ways you’re deluding yourself’. It’s got me thinking about thinking. In particular, it’s got me thinking about cognitive distortions. A cognitive distortion is an inaccurate thought that affects your perception of reality. Your mind convinces you of something that isn’t exactly the case. A simple example of a cognitive distortion is thinking that you’re dumb when in actual fact you’re quite bright. I like to call these cognitive distortions ‘crazy talk’. The problem with ‘crazy talk’ or delusional thinking is that it can set you on a destructive path of self-sabotage. ‘Crazy talk’ can make you miserable. It often leads to poor or at best, mediocre grades. Bottom line is: ‘Crazy talk’ influences your mood, behavior, and motivation at a fundamental level. And this is why ‘crazy talk’ can be so dangerous. How do you deal with ‘crazy talk’? You need to rip it to shreds. You need to pull these crazy ideas apart so you can see them for what they are: deeply flawed and out of touch with reality. So let’s dive right in and do just that. If you’re winging a test that means you haven’t studied for it. You’ve done the bare minimum (you’ve attended your classes) and you’re just going to hope for the best. Maybe you’ve said a little prayer to the test gods. But imagine if Katy Perry, Adele, or Lady Gaga didn’t practice before a big show. Imagine if they just said, “Forget the dress rehearsal! Forget warming up my vocal cords. 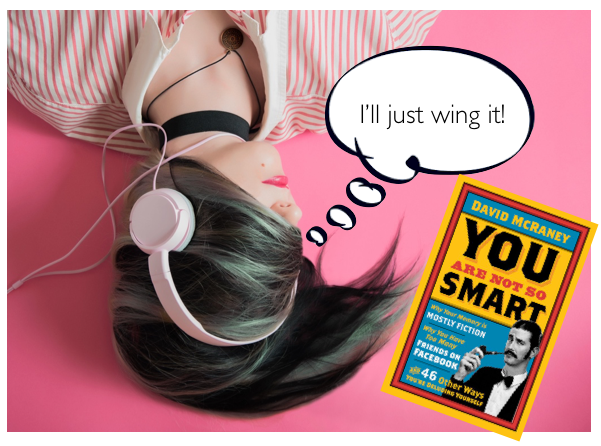 Forget practicing the songs…I’m just going to wing it!” What would you think? You’d probably think, “That’s a bit crazy…”. The same thing applies with taking tests and exams: you need to do some preparation. You need to study and revise. Whether it is taking out your notes and creating some flashcards or making a summary mind map, you need to do something! A little bit of revision can make a big difference. But winging it? Don’t expect to do well. Expect to fail or at best, just scrape through. So you think you were born average or dumb, eh? And you think this is why you find school so challenging. But in actual fact, it doesn’t work like this. “But Johnny finds maths so easy!”, you’re thinking. “It’s a breeze for him!” But here’s the thing: you don’t know if Johnny has a private math’s tutor or if Johnny’s mother is a math’s professor. Johnny may have been exposed to mathematical ideas from a very young age. There’s no denying the fact that some students pick things up quicker than others. I know from experience how easy it is to get fixated on people who look like they’re hardly doing any work yet achieve great results. But these students are a distraction from your studies. The bottom line is: just because it takes you a bit longer to learn information that doesn’t mean you’re stupid. Far from it. Your subjects are designed to be challenging. They are designed to stretch you. Don’t jump to the conclusion that because you’re struggling with a subject that this means you’re not very smart and/or not particularly good at the subject. “Without effort, your talent is nothing more than your unmet potential. Without effort, your skills is nothing more than what you could have done but didn’t”. In short, doing well at school isn’t about being smart. Success at school comes down to putting in effort. It’s about getting stuck into your studies (even when you don’t feel like it) and pushing through the discomfort when things get tough. That’s what will make you ‘smart’ like Johnny. Establishing good habits and new skills is a messy process. Change usually involves 5 steps forward and 3 (or 10 steps back). Do you think you’re suddenly going to wake up feeling super motivated to work hard when you’ve been slacking off up until year 12? Maybe. But most likely, no. You’ll feel exactly the same as every other year. The fact is that it takes time to acquire effective study strategies and make them part of your everyday routine. You may also have some deeply ingrained (and ineffective) study habits that aren’t so easy to break. Start putting in the effort and experimenting with different study strategies today. Don’t wait until year 12. Choose a strategy and apply it immediately. Don’t expect to feel comfortable as you do this. It will feel strange at first. Just know that that’s completely normal. Then once you’ve mastered that strategy, build on it with another strategy. Keep adding to your study arsenal. Just to be clear, if you have any of these distorted thoughts from time to time, you should know that you’re not actually crazy. It’s just that you’re thoughts aren’t always right. But thought can be changed and corrected through challenging them. Alternatively, you can choose to ignore each distorted thought (“Yeah yeah, talk to the hand…”) and simply carry on with doing your work.